The word chart is described as “a sheet exhibiting information in tabular form. It is a graphic representation, as by curves, of a dependent variable, as temperature, price, etc.”; “a graph.” Charts can be seen mostly in schools, clinics, and offices since they act as a good representation of showing a much-detailed comparison or simple data. 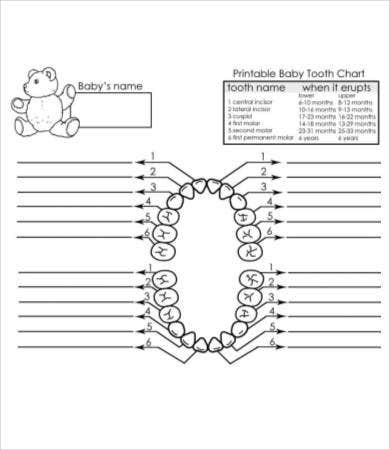 If you have kids or babies and you would like to monitor your baby’s development or if you’re a medical practitioner, especially a dentist, looking for baby teeth charts, this page is exactly what you are looking for. 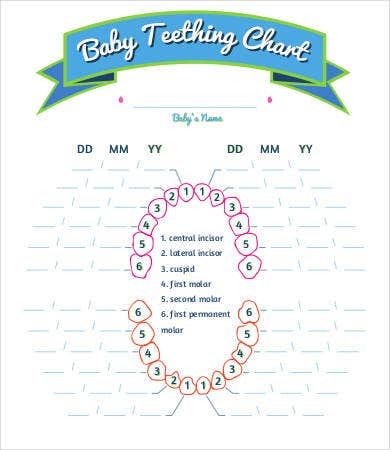 We have collated the most informative baby teething charts from all over the Internet and share them with you here. We also offer Baby Growth Chart samples on our website if you’re excited at knowing how your bundle of joy is growing. It is really fun and exciting to witness when a baby’s tooth starting to show up. It simply means that he or she can start eating solid food and is ready for other variety of meal compared to the usual baby food. This is also exciting on the parent’s part as their baby is now growing up, and some parts of his or her body is starting to develop, especially the teeth. 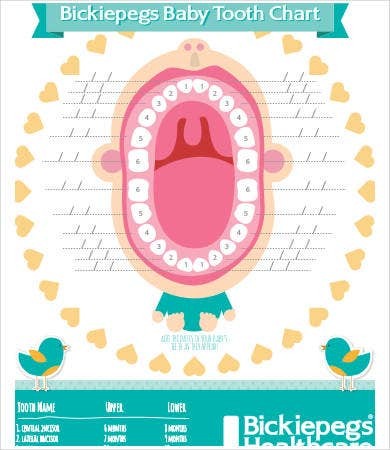 Your baby is teething when his or her first set of teeth, called primary teeth, starts to show up on his or her gums. When Does Teething Usually Kick Off? Teething usually starts around 6 months of age, but it is normal for teething to start at any time between 3 months and 12 months of age. 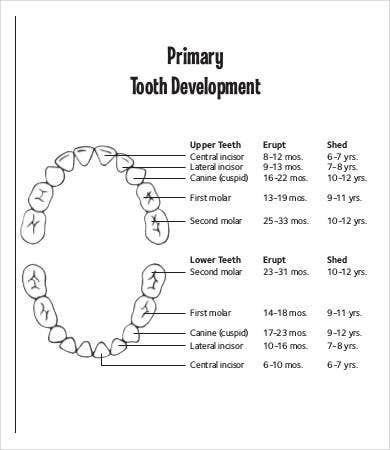 By the moment your child is about 3 years old, he or she will have all 20 primary teeth. The front teeth on the lower part usually come in first then front teeth on the upper part come in 1 to 2 months after the lower front teeth. Want to know your baby’s weight and check what an unborn baby growth looks like? Our Baby Weight Chart and Unborn Baby Growth Chart Template are perfect for you. 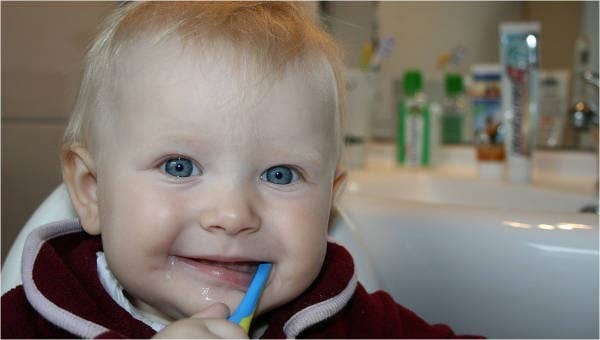 Teething sometimes is a crucial part of every growing baby, some tend to develop fever and other sickness. This can be considered normal, but it is always a best practice to seek medical help at once if this happens. Children’s body immunity are different than that of adults. 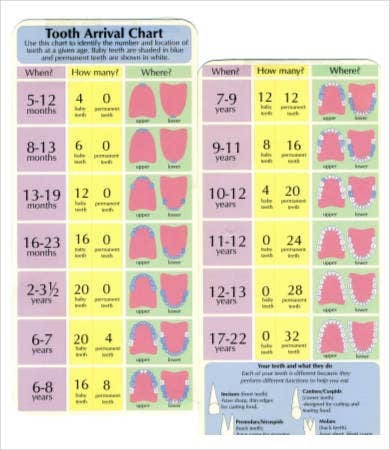 Now if you are looking for a baby teeth chart for teaching and showing purposes, our baby teeth charts are what you need. 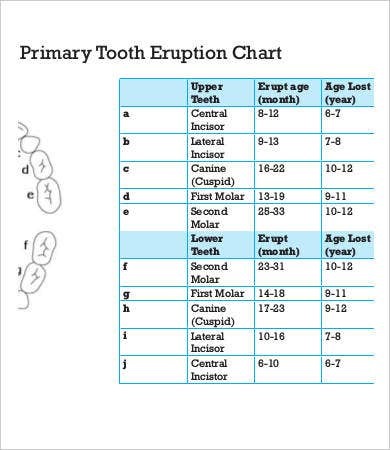 These charts contain detailed and precise information about baby teeth. Each comes in a good quality resolution for that better and much clear image layout. These are also in a high modifiable manner, meaning you can also edit them depending on what you prefer. These free templates also come in a PDF format so that you can download and print it with no hassle. 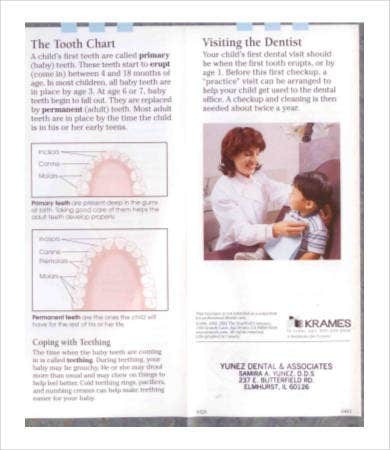 Not only were we able to help you, but you now have a chart that is useful to keep track of your children’s development. You can also share this page with your friends who are also looking for the same thing. Having a baby boy and want to know his growth? Our Baby Boy Growth Chart Template samples will surely help you.